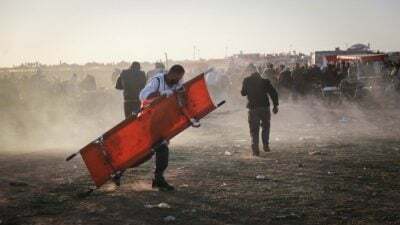 The International Committee of the Red Cross (ICRC) is concerned about the human toll of the violence on the border of Gaza and Israel, in particular, the high number of casualties. On 30 March, following the violent events which took place in Gaza at multiple locations along the border fence with Israel, approximately 1500 people required medical assistance, with approximately 800 injuries resulting from the use of live ammunition. The ICRC takes note of the strong emergency response of Palestine Red Crescent Society (PRCS), also made possible through the continued ICRC facilitation with all parties of its ambulance and personnel movements. The ICRC also provides material and technical support to the PRCS and hospitals in Gaza in their emergency response. “The influx of casualties is also straining an over-burdened and under-resourced medical system,” Edouard added. To date, the ICRC has donated urgent surgical equipment, drugs and disposables, and mobility devices required for the comprehensive treatment of more than 800 patients. As part of its work, the ICRC acts as a neutral intermediary and maintains a confidential dialogue with all relevant authorities and security forces to try to minimise the impact of violence on civilians and preserve a humanitarian space where health care workers can operate safely.